For those of us old enough to remember the Columbo detective series (which I'm not, but if I were...) Columbo had a knack for teasing out the information he needed through a low key, unassuming style. He'd scratch his head, seem confused, act like he missed an important detail, etc. then he'd thank the suspect and start walking towards the door. The suspect would think he got away with hoodwinking the detective. Then Columbo would pause at the door, say, "Hate to bother you again but there's just one more thing..." and ask a seemingly unrelated question. The suspect, already convinced they'd gotten away with it would get caught off guard and supply the key bit of data Columbo needed to nab them. I was reminded of this recently when I was interviewing a customer for a case study we want to build. I started off asking the usual questions about what the world was like before my company saved the day, what they went through and all the usual questions, including how our magic changed their lives. As these were technical/operations people, all I got was stock answers and an unsupportable "90% improvement in efficiency." Nice, but hard to substantiate and people don't believe big numbers anymore, even if they are true. I needed something really crunchy - that money quote. So I asked about how the team was compensated and how their bonuses were affected before and after. Nothing much there, just more limited view of their world stuff. My colleague jumped in and got more information on the technical considerations and challenges and that took about another 10 minutes but I still didn't have what I wanted. I asked about my company's role in the project and got a nice quote about how they couldn't have done it without us, we provided the expertise and experience to not only do the job but sell the project internally. Better, but not there yet. We were running out of time so we collected our things, thanked them for their time and began moving towards the door. I gave it one last shot, a la Columbo. "Just one more thing. What has the project meant for the organization as a whole?" And out it came. "This was a huge strategic initiative." Not only were their Dev & Test teams all working from the same platform, support costs down, IT manager life was wonderful, blah, blah, blah, they had been able to integrate a key technology into production they acquired almost two years ago. This important acquisition had to be run as a separate division for over a year until the project completed. Not only that, the company could now roll out new products months to years faster and adapt instantly to market changes and competitors. They had been pressed for time so were only going through the motions during the interview. Once it had ended and were mentally switching to their next meeting, their guard went down and they were able to share the really juicy stuff. There's nothing sneaky about this, it's just that you often get better, more useful information when the person is focused on the next task. 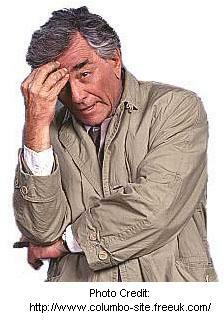 If you don't get the money quote during your interview, try a 'Columbo' at the end. You don't need the cigar and disheveled overcoat and you'll be surprised what you can get. Sometimes Techies really don't have a clear view of how they impact the business as a whole. You can do a Columbo as you're going to the door or in the hallway as you're being escorted to the lobby. Don't be afraid to try it. I do recall watching some of Columbo as a kid in the 1970s. He's still popular in Japan and reruns show regularly on cable TV - Peter Falk dubbed into Japanese, is er, different,but the "Just one thing" approach comes over well. Actually, the maddening thing about Colombo )for the villains) was that he deliberately kept quiet so the other party felt compelled to fill the silence with... information! Most of my case study interviews are done via phone and the "just one more thing" can work well if a rapport has been built with some general chat before the formal part of the call starts. Yes, we were engineered with TWO ears and ONE mouth for a reason! :-) But you are right about establishing the rapport, especially when you are doing this over the phone. Rapport is built throughout the session as you listen, comment and ask more questions, not just at the beginning.